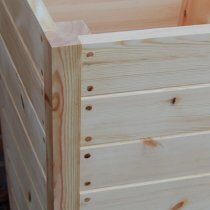 Double nesting box and feeder. 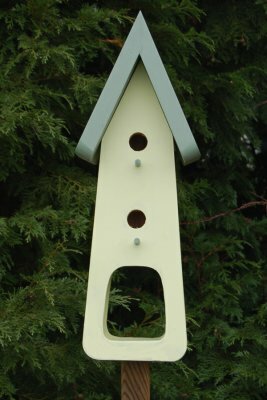 These double nesting boxes and feeders will be a lovely addition to any garden and you will love to see your bird family return year after year. You can attract many different birds to your garden by putting out food for them. 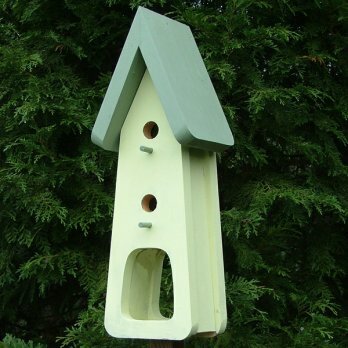 You can also attract the birds you would like to live in your garden by the type of nesting box you install. 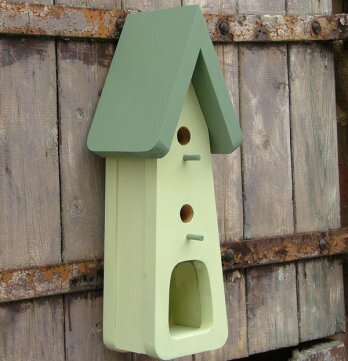 When you buy your nesting box you should be aware of what species you would like to attract. House Sparrows are very well known birds which are very closely entwined with people's lives. Their population has diminished dramatically in Britain throughout the last few of years. These wonderful little birds were one time taken for granted, but due to their recent decline in numbers, ought now be taken care of. They are regular visitors to bird tables and bird feeders, where they will feed on nearly all types of birdseed, particularly millet, corn, and sunflower seeds. yellow to brown in the winter months and changes to black in the summertime. The female house sparrow is paler in colour, when compared to the male and does not possess the black bib, white cheeks or chestnut brown nape. In place of the males black eye stripe the female has a straw coloured eye stripe, and the young house sparrows appearance is very similar to the females. If you are fortunate enough to have house sparrows visit you, you will discover that they have a very diverse diet. They will feed on just about anything. Also, they are probably the most sedentary of British birds, even the young ones will nest in the near vicinity of their parents, and they will readily nest in any nesting box that has been provided.